A Whodunit Murder Mystery $pecial Offer! Deathtrap: This Broadway thriller and devilishly clever comedy will have you spellbound until the very last moment. Join us Wednesday, September 19, on this fun day trip to The Palace Dinner Theater. You won’t regret it! Take $5 off EACH Deathtrap ticket purchased. 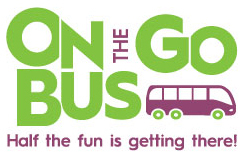 Bring a friend who has never traveled with On The Go Bus and take ANOTHER $5 off ofYOUR ticket! The more friends you bring the more you save. Example: You could take $30 off your ticket if you bring 5 new travelers with you! This special offer is only good for Deathtrap thru Labor Day. You must call to reserve no later than Sept 3 to take advantage of this deal. Call today! See all trip details HERE. John Denver – SOLD OUT! Fall Color Cruise – Only 2 seats left! It PAYS to take advantage of EARLY BIRD SAVINGS! November and December trips are filling fast. Get your tickets early and save. It’s no fun to be on a wait list! Be sure to check out the overnight stays we’re taking in October and November too!